Apple has been experimenting with upgrading the health tracking tech in its smartwatch for the last few years, and it seems one day the company may be able to monitor your blood pressure directly from your wrist. A newly published patent shows an Apple Watch band that would be able to inflate, much like a blood pressure monitor cuff you'd find in hospital or at your doctor's surgery, and give you a way to track your vitals when on the go. The patent doesn't show an accurate design of what it would look like in practice, but it's a remarkable idea considering monitoring your blood pressure is a time-consuming process that needs a lot of equipment. Accuracy would be a concern with this sort of tech, especially when it's first being developed, but the patent suggests Apple is confident in the idea working. That said, this patent was originally filed by Apple in June 2016, and despite it being two years later we're no closer to seeing it materialize. It's worth noting that major manufacturers often patent tech that hasn't even started development yet to ensure the ideas are protected, so this doesn't guarantee we'll see a blood pressure monitor launch with the Apple Watch 4. That said, it's a remarkable idea and it may be perfect for those who need to have quick and easy access to a device that can keep an eye on their results at all times. 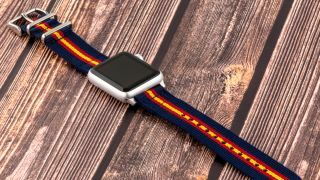 Introducing this tech would bring a whole new feature to the selection of great Apple Watch bands you can currently buy, as most of the differences are currently fashion-based.